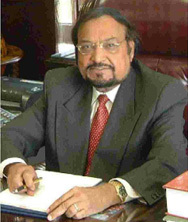 MESSAGE FROM Dr. Dayal T. Meshri President: Alliance of Sindhi Associations of Americas Inc. I am very happy to announce that a highly dedicated group of scholars; Sindhi men and women, have worked very hard, used their personal financial resources, to come up with Romanized Sindhiboli Script in the format of audio, video, and text. I am especially, greatly indebted to Shree Arjan Daswani of Singapore whose persistence, hard work, dedication and organizing ability has made this website timely possible. In spite of his failing health, he worked about 20 hours a day for many months, made phone calls all over the world and kept his promise to release this website at midnight on December 31st, 2010. He has done it! My hearty congratulations to Dada Arjan. This script will help our young and the future generations all over the world to learn reading, writing, and speaking the Sindhi language. This Romanized Sindhi Script has the blessings of our Spiritual Leader, the most revered Dada JP Vaswani of Holy Mission of Sadhu Vaswani, Pune. He reminds us often that our mother tongue is the soul of our community, the soul of our civilization and must be preserved and to be propagated among our youths and new generations. If the language becomes extinct, civilization will go with it. Our Sindhi culture is an inheritance from our ancestors the Aryans, and we should not forget that we are the direct descendants “Ariya Putra & Putris”. Preserving our Sindhiboli is our birth right as well as our obligation. I hope that many of you will take an advantage of www.romanizedsindhi.org web page, use this modern technology to teach your offsprings and friends. Thus playing an important role in the preservation and propagation of Sindhiboli and Sindhi Culture; the Aryan civilization. I am greatly indebted to the scholars and community leaders; Professor Dr. Satish Rohra, Professor Murlidhar Jetley, Professor Dr. Baldev Matlani, Professor Kanhaiyalal Lekhwani, Prof. Dr. Devendra Kodwani, Mr. Prem Lalvani Chairman of ASAA , Colonel (ret’d) Ram Gulrajani, Dada Arjan T. Daswani ASAA Project Coordinator, Mr. Lakhmi Khilani Director of Indian Institute of Sindhology, and Mr. Govind L. Chandiramani for attending the Ahmedabad Summit Conference on 29-30 of March 2010 and for their valuable suggestions and making this script possible. Last but not the least I am also grateful to all those well wishers of the Coommunity who contributed funds as well as all those who served this project, at one time or the other in whatever way, as Volunteers, I am sure their dedication will bring us the sweet fruits of their labor. Also the next generations may keep harveting these fruits for a long time. President: Alliance of Sindhi Associations of Americas Inc.